Carplus: The best solution for Rent a Car business. Carplus is the best solution for a comprehensive management of your car rental business. This software covers all possibilities and options related to this sector’s activity such as: reservations, clients, fleet control, invoicing and many others. Get Carplus for a total control over all areas of your Rent a Car business. As one of the program’s main features, it will easily enable the extraction of custom made statistics thanks to its architecture client/server and database engine MSSQL. Another of the key features is the possibility of making online reservations. You could manage and control all bookings through Carplus. Just Carplus and nothing else. No further software would be required and you would also cut down on emails for enquiries and confirmations. Do not hesitate to contact with us to get personalized information and receive assistance from one of our technicians. Carplus offers top-flight performance to a wide range of businesses, whether those with a fleet of 30 vehicles or similar or higher with above 20.000 and more than 200 concurrent terminals. 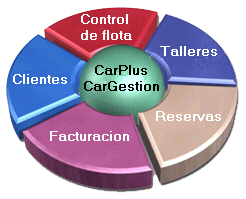 Carplus is the best solution for a comprehensive management of your Rent a Car business. This software covers all possibilities and options related to this sector’s activity such as: reservations, clients, fleet control, invoicing and many others. Get the most accurate control over your fleet from your tablet or smartphone, now is possible with Carplus 3G. Carplus 3G is the perfect work tool for active businesses where employees are always on the move, not necessarily permanently stationed at their offices. Turn your website into a powerful booking portal including a payment gateway with your bank. The best addition for customers already using Carplus application, being able to have an on-line reservation system fully parameterizable from Carplus, avoiding programming costs. Carpark: a comprehensive solution for car park business operations. Devised to ensure smooth operations for your company, covering all your daily needs and designed as a web application that can be accessed by any peripheral using an internet browser.